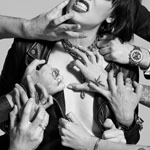 Share the post "Album review: HALESTORM – Vicious"
I thought I’d died and gone to heaven when I heard Halestorm’s fabulous 2009 eponymous debut. And it remains one of my favourite female fronted rock albums of the last decade and beyond. But frankly, for me at least, things have gone steadily downhill since then, the commercial AOR edge of the band’s debut giving way to increasing bombast and ‘shoutiness’. That trend continues with Vicious. But while their last two albums – The Strange Case Of – (2012) and Into The Wild Life (2015) both had their share of more ‘accessible’ songs, Vicious rarely strays from trying to flay the skin from your bones. The mainstream press would have you believe it’s one of the better releases of its type this year. And that may well be the case, but it’s all about aggression and to my ears screams ‘corporate product’. The subtleties producer Howard Benson brought to the original party, have finally given way almost completely to visceral hard rock as the band employ their most ‘metal’ producer yet in the form of Nick Raskulinecz (Korn, Mastadon, Alice In Chains). This entry was posted in ALBUM REVIEWS, ALBUM REVIEWS (Mobile), All Posts and tagged album, Halestorm, hard rock, Lzzy Hale, metal, review, Vicious. Bookmark the permalink.